I have been dying to share this project with you but had to wait for my friend Jo’s birthday today so that I wouldn’t spoil the surprise of the gift I created for her. Of course it has to begin with a birthday card doesn’t it? 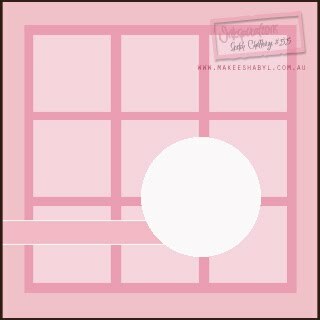 I’d seen this sketch over at www.Makeeshabyl.com and although I didn’t submit this project, I happily used the challenge as inspiration for my card. Yeah Yeah I know another medallion card! 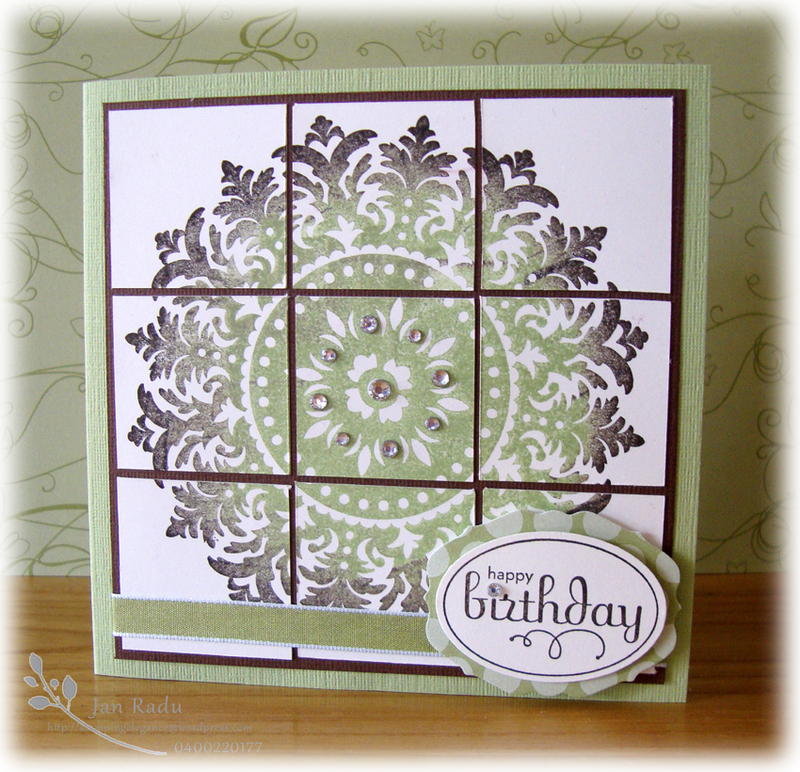 I just love this stamp and it lends itself SO well to a square card. I stamped on Very Vanilla cardstock using the rock and toll technique first stamping onto Pear Pizazz and then rolling Early Espresso around the edges of the stamp. Once I’d stamped onto the Very Vanilla square, I cut evenly into squares and then placed the whole image onto an Early Espresso Mat. My card is actually Textured cardstock in Certainly Celery which tones really well with Pear Pizazz. 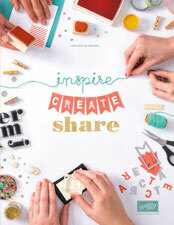 I created my Tag using the Lots of Tag Die and my bigshot. This delicious polkadot DSP is from the In Colour 6×6 pattern pack which is a Level 1 Hostess Set. 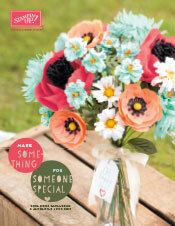 My happy birthday perfect punches sentiment is punched using the wide oval and popped up on dimensionals. How did I get my stamp so sparkly on my candle? 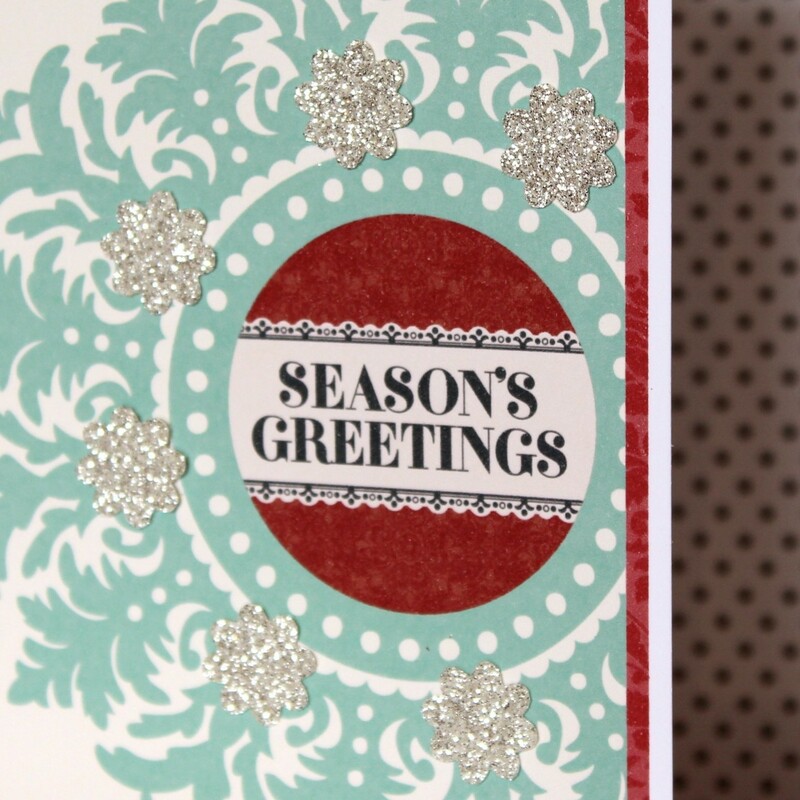 First I stamped in versamark, then rock and rolled with Pear Pizazz and Early Espresso, then added heat and stick powder, heated that with my heat tool and finally sprinkled Dazzling Diamonds on top. 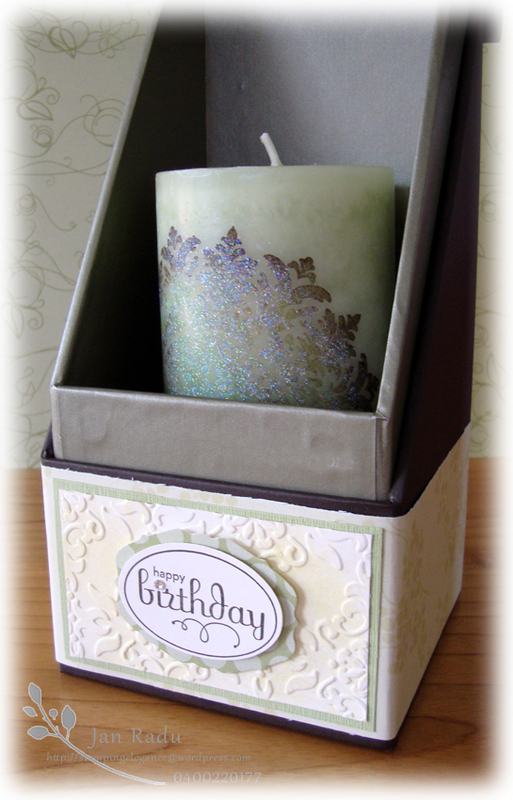 You need really high quality tissue paper to do all of this and be able to heat prior to applying to your candle. Thinner tissue will start to melt the first time you heat your heat and stick powder so beware! How well does this candle fit into this box? Can’t tell you how satisfying it was to create a really unique gift for my friend – something that will never be found in a store. 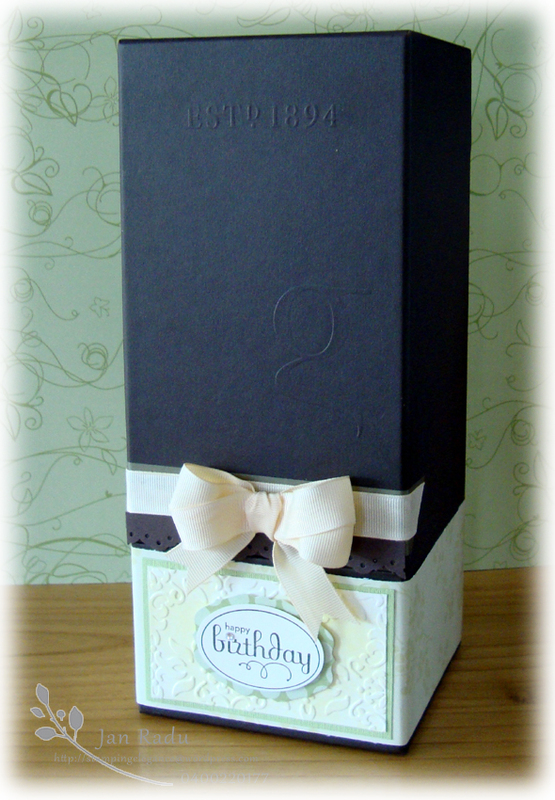 Being able to recycle and utilise a gift box this way was so much fun! 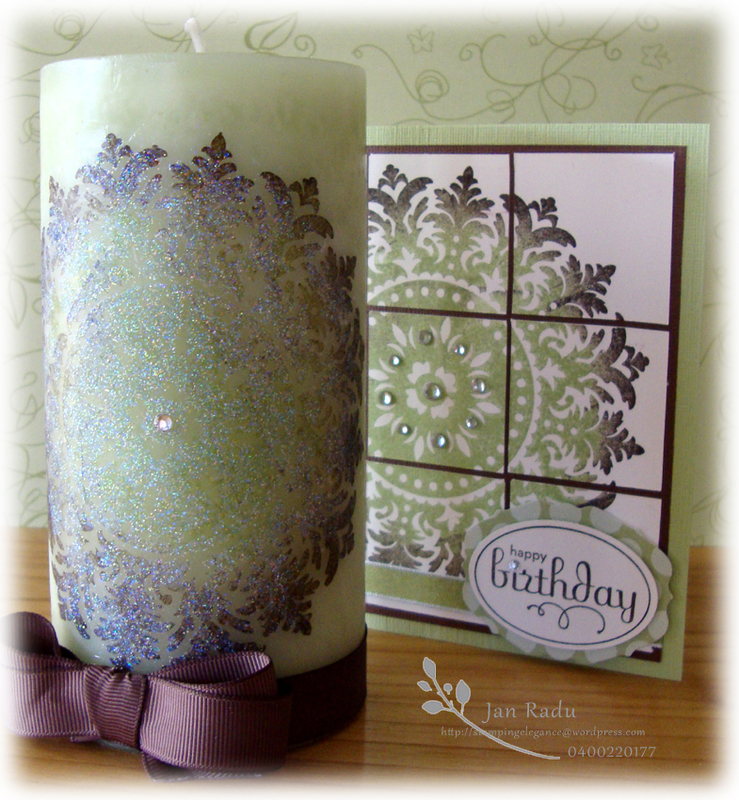 If you are interested in learning more about stamping on candles or creating a special card like the one above, why not host a workshop at your place with a few friends and I can show you this and other techniques using Stampin Up products.